I’m pretty sure that’s the sound, one that you hear, or feel, as you are brought a little bit back down to earth. I thought it could be a “thud”, or a “boosh”, but they seemed too harsh considering. So “Boink!” is what I decided on. As the final buzzer went last night and the Giants took only their third defeat in the EIHL since the start of October, but their second defeat in a row for the first time since September, I realised that maybe this was just what we needed, a little dose of reality. A little bit of being brought back down to earth. It’s been a long long time since I’ve written a hockey blog. It’s something I used to do a lot, and while the Giants were riding high through October and November I had one bouncing about at the back of my head. One where I was telling myself “yeah we’ve smashed the Devils 8-1 in Cardiff… but come on Patrick, you know how this works”, or “This road record is phenomenal, but surely there’ll be a catch”. However I stopped short of opening Word and putting finger to keyboard because, quite frankly, I was enjoying the ride. Also with the podcast, work and real life, the idea of actually sitting and putting these thoughts into salient points may take a little more time and effort that I felt I could afford. I had been really enjoying the pieces on KotG over the summer from the likes of Steve and Dave, the awesome article from Robbie Sandrock and more recently the Friendship Four previews from Aaron. The depth of hockey writing talent in the Giants fanbase alone is superb and hopefully we’ll be entertained by more of it as the season goes on. But that noise, that feeling, that reality has inspired me to press these keys. The intriguing side of a defeat is the reaction it instils, not just in yourself, but what you witness in others. Personally last night’s defeat was a dig in the chops, little bit of wind out of the sails and other such clichés. There’s a level of anger, disappointment, resentment and then reality. The last 2 months of hockey has been among one of the best, most persistent runs of form in recent memory. 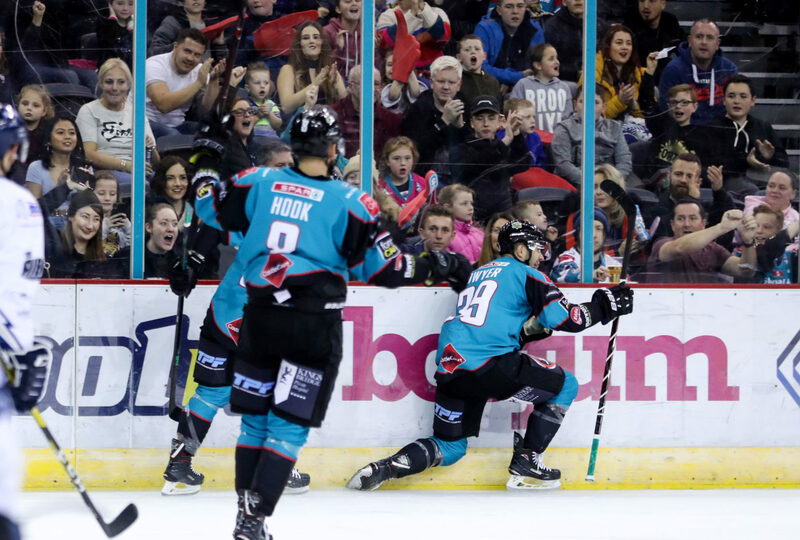 Not since we ran roughshod over the league to lift our last EIHL title has a Giants team shown such ability and drive to take victory after victory. Especially on the road. But even that team had its adversity. This isn’t a “calm down lads” piece, actually far from it. I’m suggesting you do NOT ignore the last two defeats. (Another cliché warning) You learn more about yourself in defeat than you do in victory, and what was refreshing was Adam Keefe’s post-game interview on FreeSports. He took it both as a defeat and a learning experience. Sheffield had a series of 2 on 1 breaks against us on Sunday, and to see Dundee do the same to punish us on Wednesday night was both frustrating and disappointing. The level of ability in this team has been on display for 2 months, but it’s also been on display to everyone else. Pach will have done his research, with the 8-0 still burning in his heart, he’ll have watched that Steelers game again and again, picked up where the Steelers hurt us and endeavoured to do likewise. But you have an equally as clever set of coaching minds on our own bench. Keefe, Stewy, Dwyer and with Ferland and Vandermeer in the thick of it, there’ll be a reality set in that work needs done. There is a long long LONG way to go. Cardiff may be digging out the points in OT and the likes, yet Nottingham have found form, Sheffield are back in the hunt, and the Giants still lead the way, despite back to back defeats. But what about us? The fans? A lot of us sitting at home for the guts of 2 months chomping at the bit for home action. Hockey at the SSE Arena that is about to explode to life with a cacophony of noise that will once again fill those stands with teal, red and white. For us, the expectation is high. 13 wins from 16 games on the road is a remarkable record, but not one that was done in front of us. In front of our own fans, on our own ice, in our own city. And it is only right that that expectation should be high. It’s not realistic to ever believe that a team can go through a season unbeaten. It is such a rarity that the teams that do so are correctly lauded. Defeats come, and they sting, they embarrass and they anger. But they still come to every team. However such a reality does not prevent the growth in expectation. The want to win, the drive to win, the desire to win is good. We are going to suffer defeat, sometimes in the most unlikely of circumstances, through our own failings or the superiority of others, and when that happens, we learn from it, pick ourselves up and go again. But don’t forget those defeats. Nor fear them. Because as the battle for the league title takes a real hold of us all after Christmas, the Giants will be at home. The expectation will grow. This team have shown in the last two months that they can defeat every other team in the league, in their own barn. But now it’s time they came to ours! And that’s the reality!